Geneva, 25 August 2008. CERN has today announced the success of the second and final test of the Large Hadron Collider’s beam synchronization systems which will allow the LHC operations team to inject the first beam into the LHC. Friday evening 22 August, a single bunch of a few particles travelled down the transfer line from the Super Proton Synchrotron (SPS) accelerator to the LHC. After a period of optimization, one bunch was kicked up from the transfer line into the LHC beam pipe and steered counter-clockwise about 3 kilometres around the LHC. “Thanks to a fantastic team, both the clock-wise and counter-clockwise tests went without a hitch. We look forward to a resounding success when we make our first attempt to send a beam all the way around the LHC,” said Lyn Evans, LHC Project Leader. Both the counter-clockwise and clockwise tests are part of the preparations to ready the LHC, the world’s most powerful particle accelerator, for the eventual acceleration and collision of two beams at an energy of 5 TeV per beam. This unprecedented event is foreseen to take place by end 2008. 10 September: The first attempt to circulate a beam in the LHC will be made on 10 September at the injection energy of 450 GeV (0.45 TeV). This historical event will be webcast through http://webcast.cern.ch, and distributed through the Eurovision network. 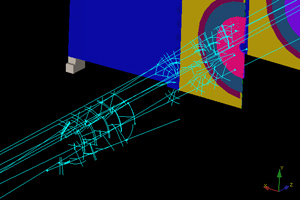 See http://www.cern.ch/lhc-first-beam for further details. 3 October: CERN will host the LHC Grid Fest, a celebration of the LHC Computing Grid, a global computing grid designed to handle 15 million gigabytes of LHC-related data every year. The day will feature presentations, demonstrations, tours of the CERN Computer Centre and more. See http://www.cern.ch/lcg/lhcgridfest for more details. 21 October: CERN will host the Official Inauguration of the LHC with representatives of CERN member and observer States.